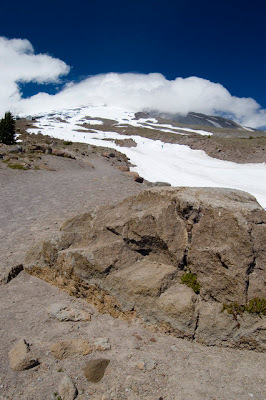 This is Mount Hood from a bit above Timberline lodge a week ago. We took one of the trails up the mountain to get clear of some construction equipment. Andy came to the conclusion that living at near sea level his entire life wasn't helping him in his endeavor to climb the trail. In case you were wondering, yes, those little black specks on the snow are skiers - well, mostly snowboarders. I think you catch a shuttle at the lodge and that takes you to the top of the slushy run.